Vilanculos is renowned for its superb variety of white sand beaches, alluring golden sunsets and tall palm trees. 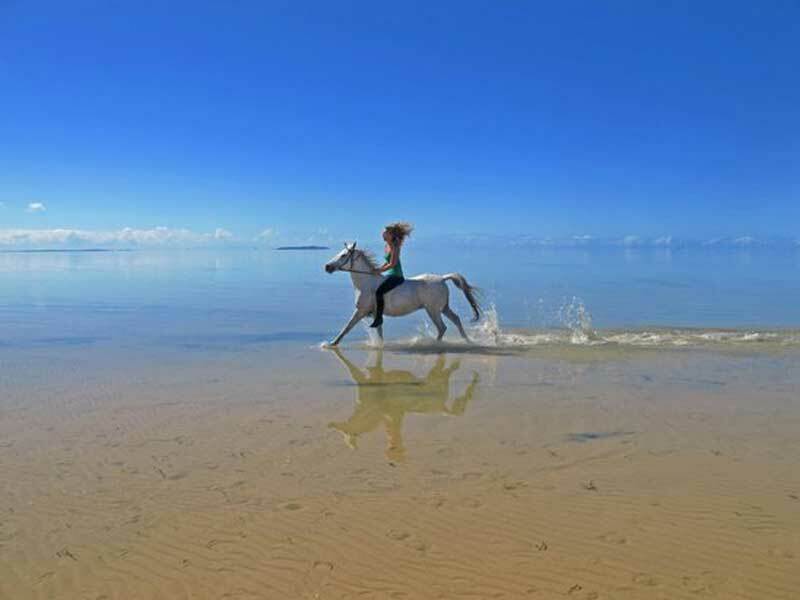 The beach stretches for tens of kilometres allowing riders plenty of opportunities for exhilarating canters and long trots. The views from the towering cliffs overlooking the Bazaruto Archipelago are extraordinary and will be a memory you will never forget. 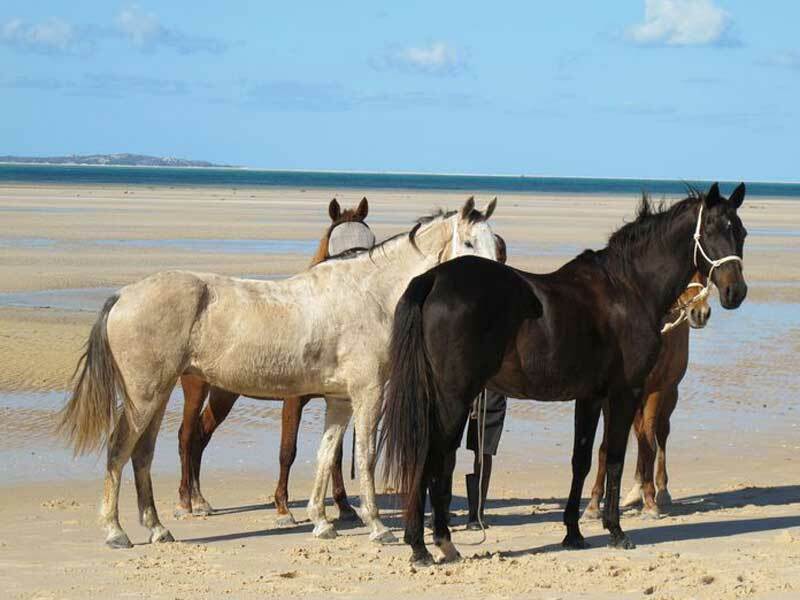 We have a herd of just under 20 horses in Vilanculos. 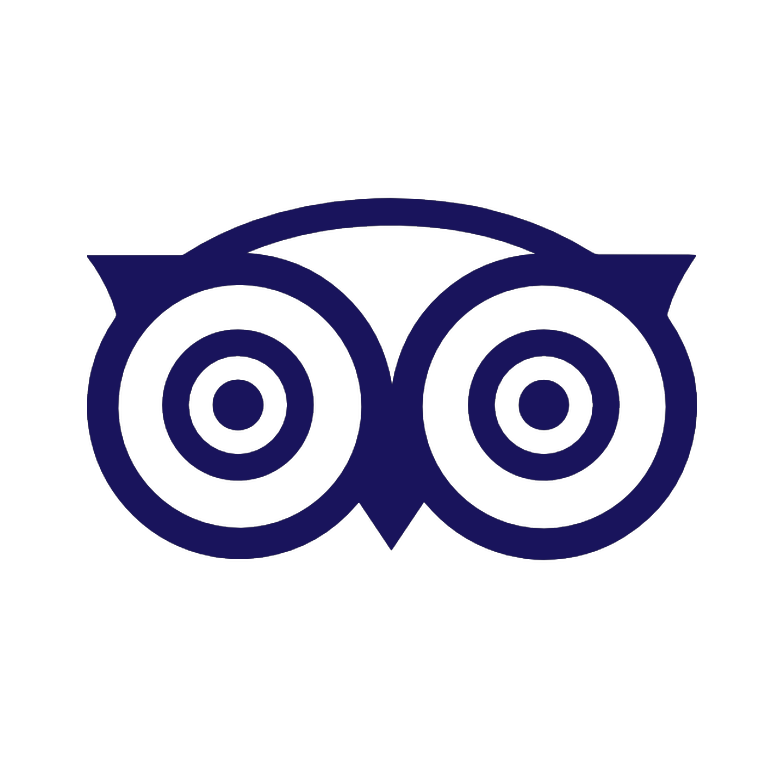 They are well looked after by a group of dedicated staff headed by Pat and Mandy Retzlaff. 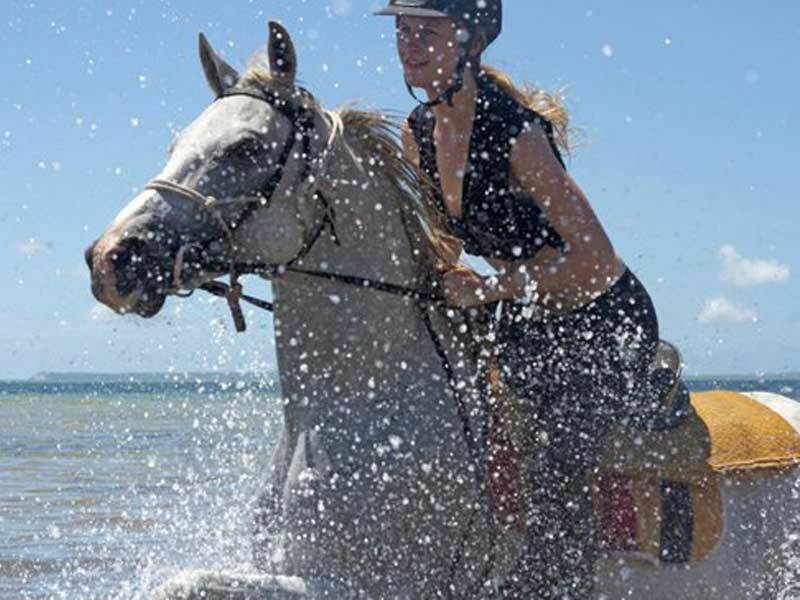 There are a variety of rides along the coast and inland that cater for beginners to experienced riders. 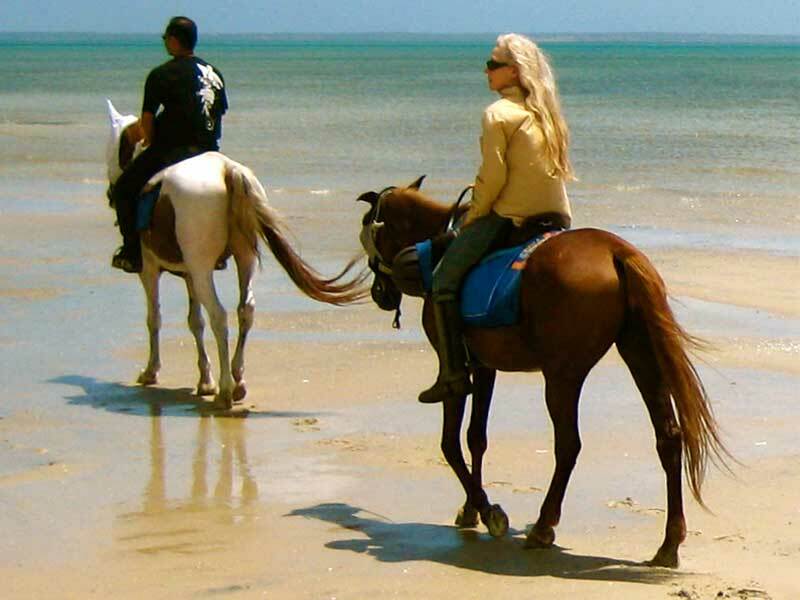 Our standard one and a half hour ride is the most popular and convenient and it caters for all riders at any level. The ride incorporates all the wonderful eco-systems in the archipelago; wide open beaches, incredible cliff top views, pristine dune bush and mangrove shoreline. 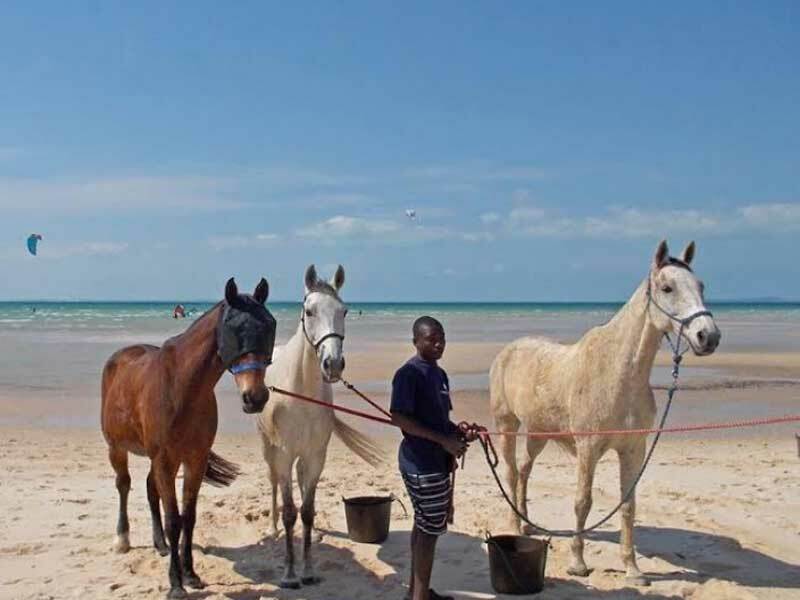 The spirit of fun and adventure runs deep at Mozambique Horse Safari so saddle up and enjoy a truly unique African adventure on our wonderful horses. Pat and Mandy Retzlaff’s were married in 1978 and in 1992 they began to farm Crofton in Zimbabwe, an idyllic tract of land, girdled with streams and forested hills, its boundaries patrolled by tame elephants trained to keep poachers away. It was a charmed life, but only a matter of time before Robert Mugabe started dismantling Paradise bit by bit. In 2002, the Retzlaffs were handed an official letter giving them four hours to leave their farm or else lose all their possessions, maybe even their lives. Their first thought was for their horses. To the Retzlaffs, horses were extensions of the family: the gentle mare Princess who had no fear of humans; Frisky, a little gelding who compensated for her size by her feistiness; Deja-vu, the foal found impaled on barbed wire and saved in the nick of time, and the aristocratic mare, Shere Khan, tallest and proudest of the horses. As neighbouring owners retreated, the Retzlaffs found themselves looking after horses left behind. They became ‘the horse people’, taking calls from frightened farmers at all hours of the day and night. Mugabe’s war veterans had no use for horses except as a source of meat. Many farmers had shot their horses rather than abandon them or leave them to the lions. Carefully tended fields returned to scrub. The nights were filled with the lights of fires, warlike chanting and the beating of drums. Crofton was razed to the ground. The Retzlaffs moved with their ever-growing herd of horses from one empty farmhouse to another as their neighbours gave in and left. As a last resort, they corralled their horses at their children’s school. But if the horses were to be saved, the only option was to take them south through the dense pine forests of the Mountains of the Mist and over the border into Mozambique. They had made it out of Zimbabwe alive and rescued 104 horses. Almost at once more problems emerged. Poachers cut through the fencing and began slaughtering horses for meat. A scheme to grow paprika fell through and the Retzlaffs lost all their money. To pay off the farm’s debts, they had to run separate riding schools. 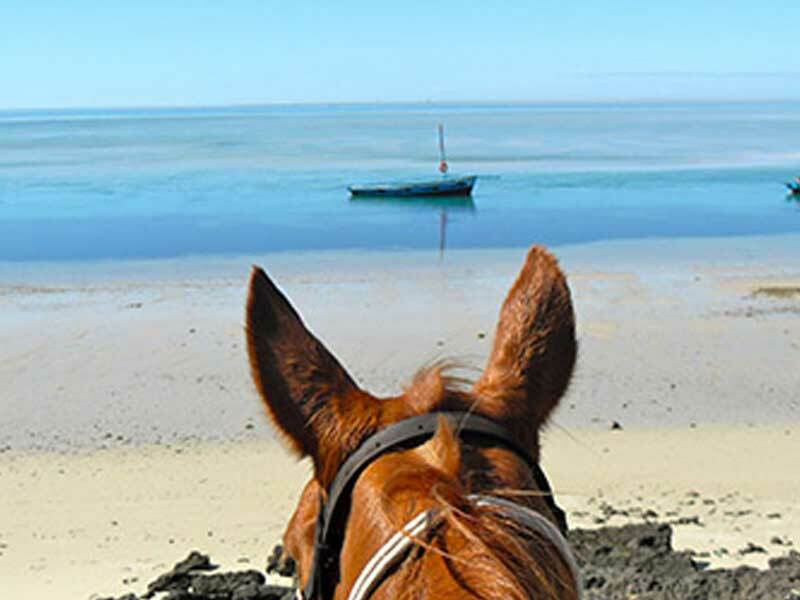 Pat tried his luck at Vilanculos on the glittering Indian Ocean where he gave tourists rides on the crimson sands. Mandy stayed and saw one of their best-loved horses, Deja-vu, slaughtered by hostile neighbours after a bitter and prolonged dispute over some land. When Mandy finally joined Pat after a year apart, she found home was a tiny thatched-roofed hut yards from the sea. There was malaria and no clean water. 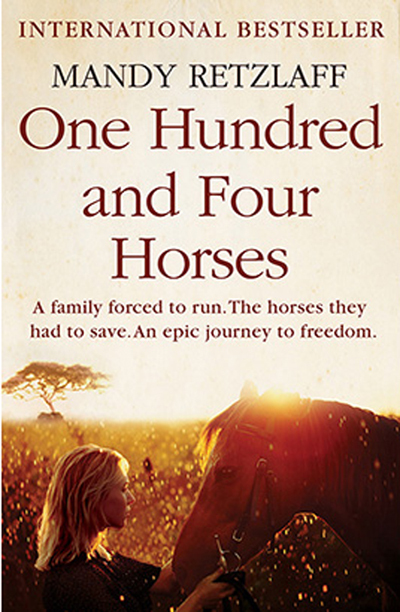 ‘Mandy,’ Pat enthused, ‘you’re going to love it.’ ‘In Africa,’ she writes wryly, ‘elation in the face of utter madness is sometimes the only way of getting out of bed in the morning.’ But life had one more cruel trial in store for the Retzaffs and for the core of horses that remained to them. One by one, the horses they had rescued from Mugabe’s war began to die from a mystery virus which turned out to be poison from a toxic sun hemp growing in the field in which they were pastured. Even the great Shere Khan succumbed, cradled in Mandy’s lap. Of 104 horses who came across the mountains, only 26 now remained to them.